Diary Despite evidence of chomping hippos in the campsite the kids were up at 5am, well before dawn, and Ella’s birthday celebrations were well under way by the time I surfaced considerably later. A birthday breakfast of the usual porridge was served with a follow up of weetabix for those who were still hungry. Kids and Clare off to the pool overlooking the Nile as I cleared up the breakfast stuff. 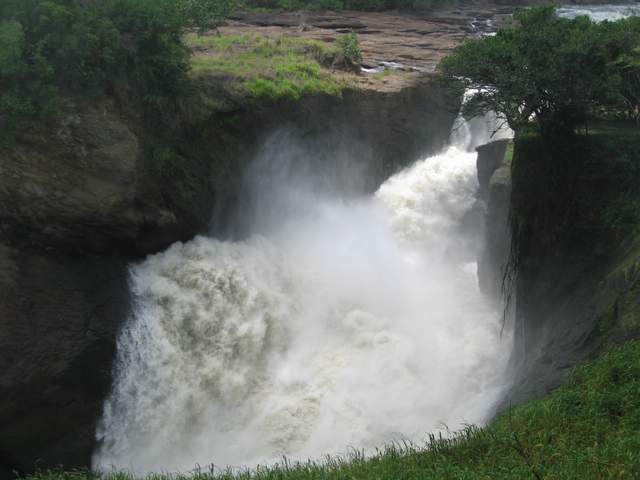 Had an early lunch of fish & chips and then for a drive in the National Park and to the impressive sight of the mighty Nile being forced through a gap of 6 metres at the Murchison Falls. Moving cars always attract tsetse flies, so wind up the windows and put the aircon on as we cruise along spotting lots of game at a serene 15mph. Ella phones her Granny and Grandpa on the mobile from the car in the National Park to tell them about her day, amazed to even get a signal! Get back in time for an hour on the Nile, as the sun goes down, in a motor launch watching the hippos, crocs etc watch us. Return in time to have a slap up meal in the restaurant washed down by a couple of bottles of Bell beer for us and cokes for the kids followed by birthday cake and the entire staff out singing happy birthday. Back along the track to our campsite to find Moses, who has been on baboon watch, has lit the fire and several lanterns and we sit down with a glass of cold South African wine out of our fridge as the kids turn into bed, tired, but happy. It does sound like a dream I know, but it really happened like this.